All those tulips I photographed this winter were very nice. 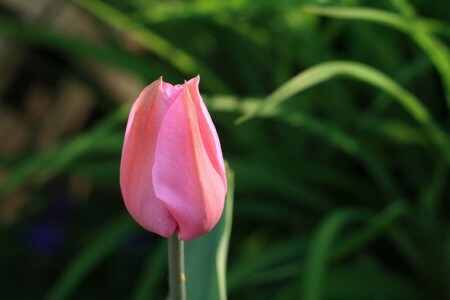 But there’s something even nicer about a tulip in my very own garden. Very pretty. Especially when it’s accompanied by sun! And it’s pink to boot!!! That’s a lovely shade of pink. My tulips opened early and then the local rabbits bit the flowers off. It looked like a tulip beheading. Have a great weekend. BEAUTIFUL!!! My tulips are all gone now…but on to other beauties! It’s been ages since I’ve been here to comment, but I wanted to say hi. Lovely tulip photo! Tulips are always a sure sign of spring. Tulips are one of my favorite flowers, second only to peonies. Beautiful! I love that evocative sideways light. Hope to see you tomorrow…. How lovely! If that were in my garden it would be just a stem as the deer love to eat all my tulips.